adidas' marketing pitch: A tempo running shoe designed for mid to forefoot strikers. Upper: Mesh, synthetic nubuck overlays, welded layers. Inner sleeve construction. Midsole: Dual density. 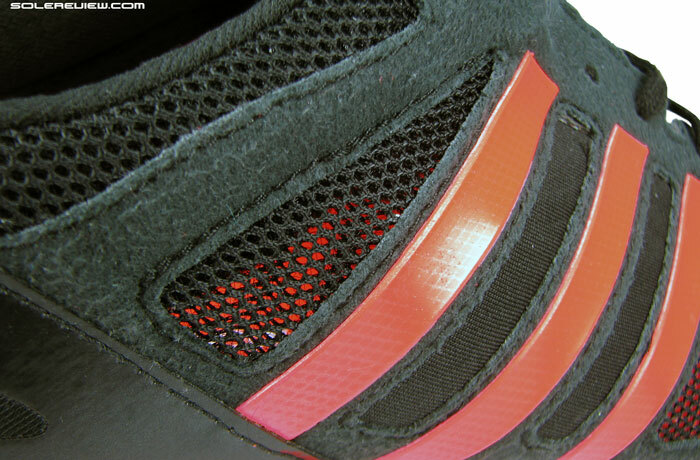 EVA upper rim and forefoot sidewall over a Boost foam layer. Outsole: Single piece, Continental branded carbon rubber. 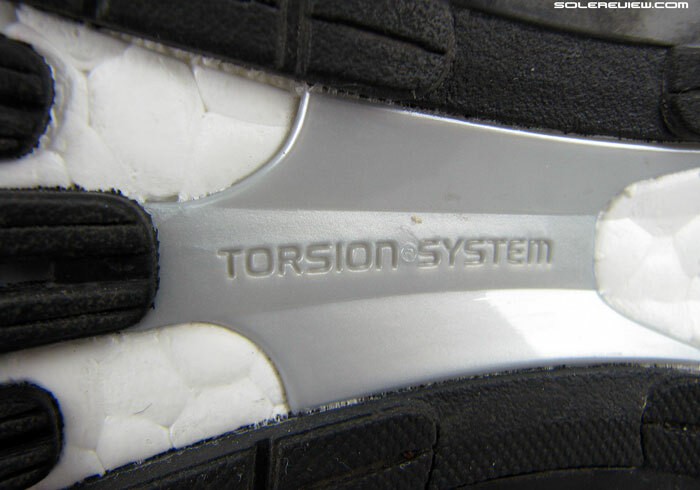 Torsion plastic shank under midfoot and medal heel. This is a stabler and firmer version of the Boston 5 Boost. Or the lighter and tempo avatar of the Supernova Sequence 7 - whichever way you want to look at it. The horrible quality on our pair ruined what could have been a great shoe, and we have a feeling there are many such examples running amok in the market. Sad. Stability, transition, upper interior is smoother than adios and Boston. Another one joins the Boost platoon. Undeniably, there’s a bright side to most adidas models getting the Boost makeover. Namely, an introduction of a novel ride character which mixes responsive cushioning, transition consistency and a deformation free midsole, all of which are hallmarks of the Boost foam. Our Energy Boost 2 review has all the goods on the science of it, in case you’re interested. And likewise, you could discuss the flip side of Boost-ification. Most shoes start losing their individual personality traits, overwhelmed by the singular influence of the new Boost material. It removes the layering from each shoe’s ride, and it’s almost as if you can second guess a shoe model just on the basis of how much Boost it packs in. It becomes even easier if you’ve owned a few pairs of adidas Boost models in the past. Then you can point at a shoe and say things like, ‘yeah, it seems to have slightly less Boost foam than my Supernova Glide, so it should be a little firmer, yet have some of the bounce my Glide 7 has’. And you know what, that might just end up being a fair assessment of the situation. A faster Sequence 7. Or a firmer, stabler Boston 5 Boost. So when we had an early look at the Tempo 7 Boost pictures last year, we thought, ‘this should feel like a firmer, stability version of the Boston 5 Boost, and a lighter, speedier version of the Sequence 7 Boost.’ This was without any prior experience on the Tempo 6, and guess what, that is exactly what the Tempo 7 Boost turned out to be. Naturally, things like the upper fit and how it differs from other adizero Boost models is something you can’t take a blind shot at. But besides that, there’s a sense of predictability which accompanies the Boost line. This makes differentiation a hard nut to crack, and that invariably leads into a price-value challenge at some (future) stage. There is only so much you can do with an upper (ok, the Ultra Boost’s prime knit top is an exception, and an example of clear segmentation), so there needs to be an overall freshness and tiering strategy. Boost is definitely a magic bullet in adidas’ arsenal of footwear tech, but the brand needs to know how, when, and where to use it. Otherwise, product fatigue is a distant but real threat. Nike excels in this fine art of differentiation. Lunarlon, Free and Air bag based models are able to differentiate themselves by the virtue of their on-ground performance. But hey, who knows, adidas still might have some cards yet to be played. The Tempo 7 is part of the adizero assortment, a collection of performance oriented models in categories like running, football and baseball. Includes apparel and accessories too, so it’s a pretty vast spread. Getting to the matter at hand, then. The newest link in the chain of Boost midsoled models is the 2015 Tempo 7 Boost, a shoe which is part of the lightweight adizero line-up. The adizero assortment focuses on performance oriented footwear, and cuts across multiple categories, including soccer. On paper, the Tempo 7 is the successor to the non-Boost Tempo 6. But as with most Boost upgrades, the level of differences should be huge. We haven’t tested the T-6, so will be great to have someone fill in the blanks for us. 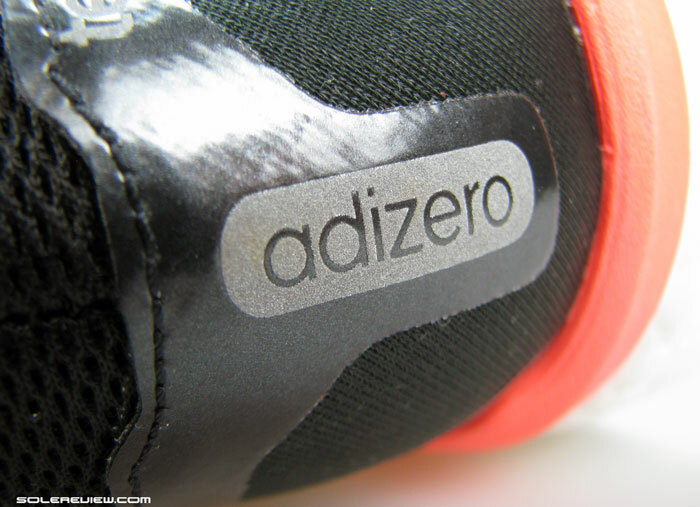 In running context, adizero translates into a motley crew of training and race focused models. This is a well established sub-category which most adidas loyalists should be able to successfully recall, as a number of past lightweight models have been graced with the adizero prefix. In present day, the adios 2, Boston 5, Takumi-sen and Tempo 7 are recognizable members of the adizero collection. Takumi is a true racing flat, followed by the more cushioned adios 2 boost, with the latter being the choice of many long distance adidas athletes. Boston 5 Boost shares some elements with the adios Boost, but is biased towards being more of a daily lightweight trainer. The Tempo Boost runs the firmest within the mix which has the adios and Boston 5. The Tempo 7 Boost differs from the Boston 5 in a few ways, and we’d like to think these are the summarizing stats for the shoe. The Tempo is the firmest of the trio which includes the adios 2 and Boston, in addition to the widest fitting. Its upper also includes an inner sleeve, which is not part of the other two. Perhaps an apt way to describe the Tempo 7 is that it sits at the fringe of the adizero line, a point where lightweight ends and traditional trainers begin. 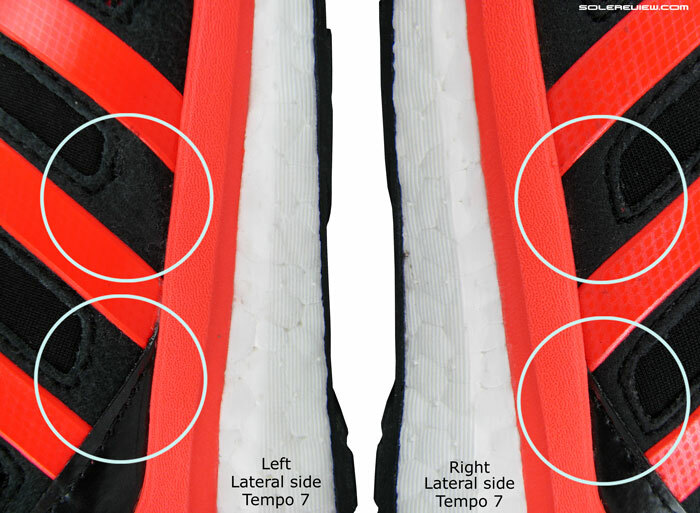 Much like the Adios and the Boston, the Tempo 7 also boasts of regular heel to toe drop (10 mm or whereabouts), so will work for users who don’t want a reduced drop yet crave the lightweight construction. 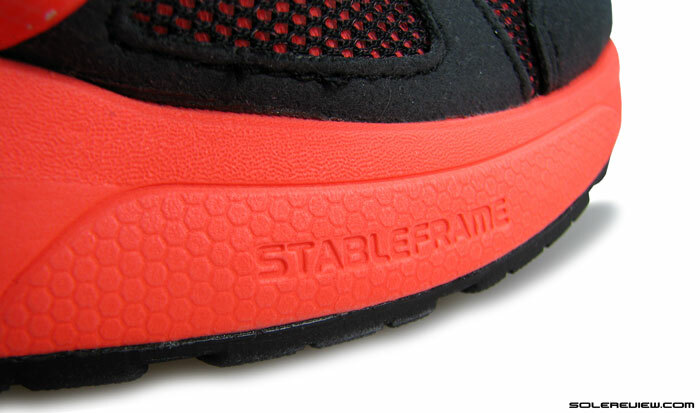 Stableframe is the name for the midsole design with a forefoot biased stability aspect. A Stableframe midsole is what differentiates the Tempo 7 Boost’s ride, making it firmly cushioned, and with a moderate motion control character. 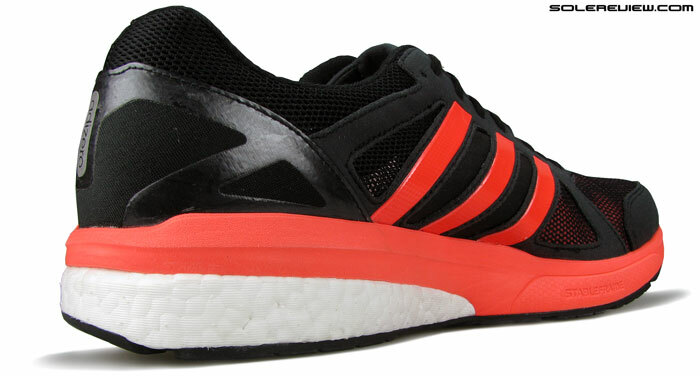 Like what we encountered on the Sequence 7 Boost, the adidas Stableframe design does not choose to employ a firmer density medial post, which is usually a mainstay of stability shoes. Instead, the Stableframe midsole focuses on improving stability as a whole, and limits motion control to late stage instead of kicking off from the heel area. So adidas is not off the mark when they say that the Tempo Boost is designed for forefoot strikers; the latter group of runners will be able to better tap into the shoe’s stability potential than rearfoot strikers. 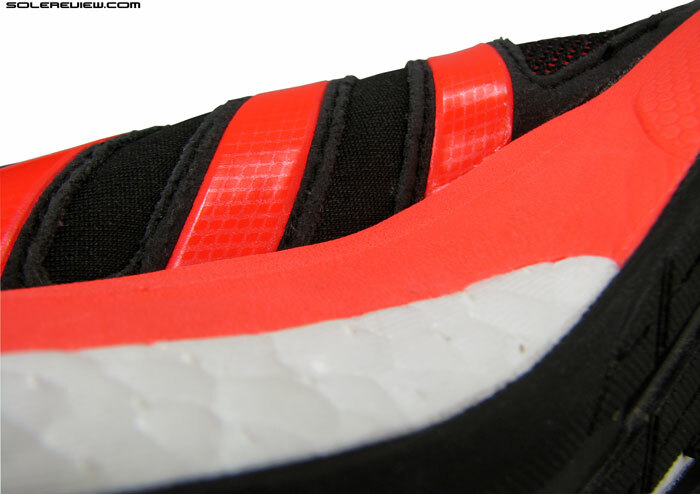 A firm layer of EVA (in red) separates the foot from the Boost midsole and makes the ride firmer, but there are little motion control elements in the rear-foot area. This is how it works. A firmer layer of compression molded EVA is placed atop the Boost midsole, and except for an opening under the forefoot, it completely insulates the foot from close contact with the Boost foam. 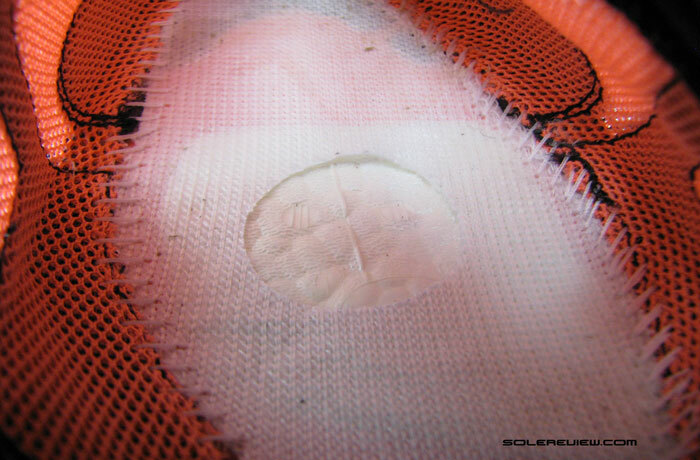 The midsole walls are left relatively untouched, with Boost foam forming majority of the sidewall. The only structural difference between the lateral and medial side is that the medial midsole has slightly raised rims. A Stableframe EVA base makes the ride firm yet consistent. The outsole is bridged by a Torsion shank under the midfoot. 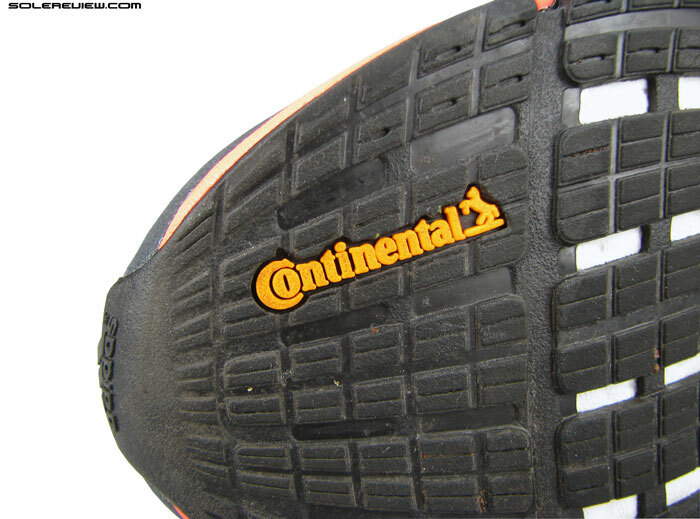 The Tempo 7 is fitted with Continental branded rubber. Yes, a collab with the German tyre maker. If you are a forefoot striker, rejoice. Boost foam is exposed through a forefoot opening, giving you access to an elevated level of cushioning and feedback. The effect of this is a firm ride, and as the name suggests, tempo run friendly. Transitions are helped by the consistent feel of the midsole, and by the full contact Continental rubber outsole with a Torsion midfoot shank. 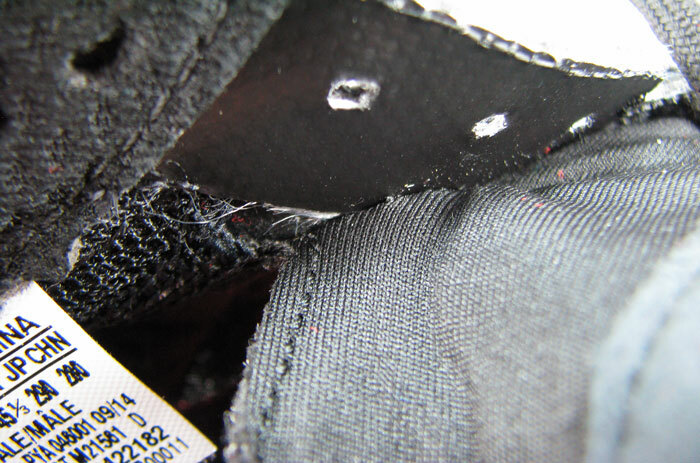 Lateral heel section cuts in at an angled bevel to smoothen heel strikes; a familiar characteristic of most adidas shoes, including the adios, Boston, Glide and the Sequence. The Tempo Boost might have an exposed section of forefoot Boost inside, but the Stableframe sidewalls increases firmness when compared to the Boston 5 Boost. And yet again, forefoot striking runners will be in a better position to access the cushioning and ground feedback through the softer Boost foam core – rather than heel strikers who’re going to use the forefoot merely from a transition perspective. 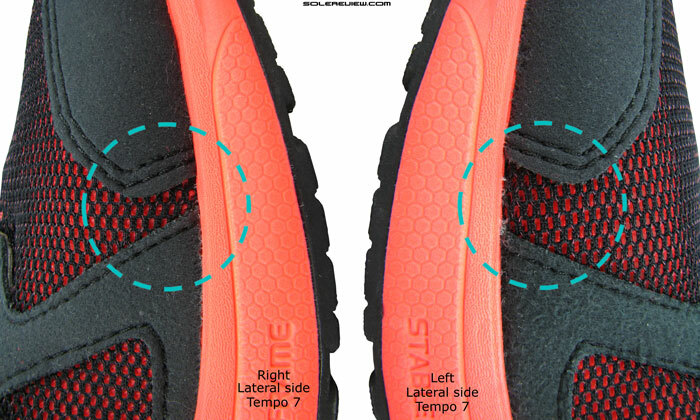 In short, the level of ground feedback will be decided based on how you land in the Tempo 7. 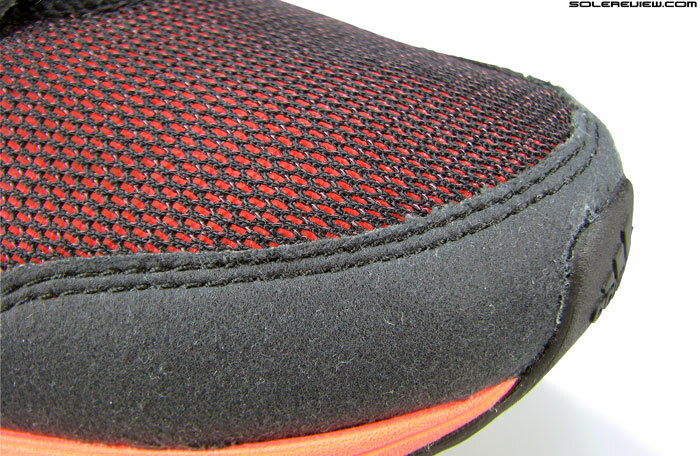 Molded sockliner with a fabric topcloth is removable. Do the patterns remind you of something? This is the same insole which goes inside the Boston 5 Boost too. Cushioning’s there in deeper reaches of the midsole, and is not something you get right under your feet. The molded EVA insole is what lines immediate underfoot, and that’s the first layer of cushioning. The Boost foam is beneath the firm Stable frame, so its cushioning effect and responsiveness is felt at a higher cadence and speed. 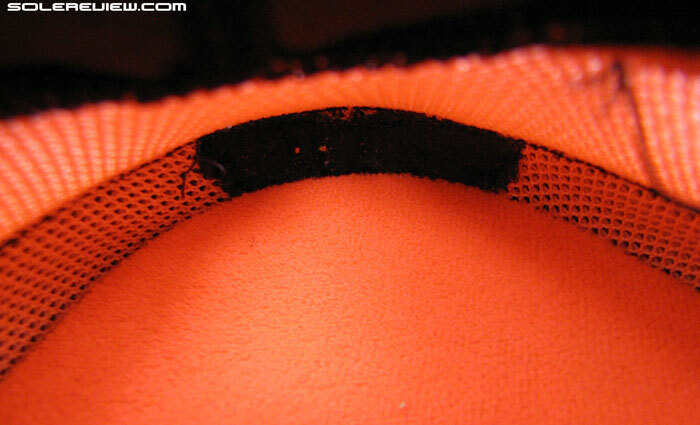 Boost foam in an exposed cavity under the heel. 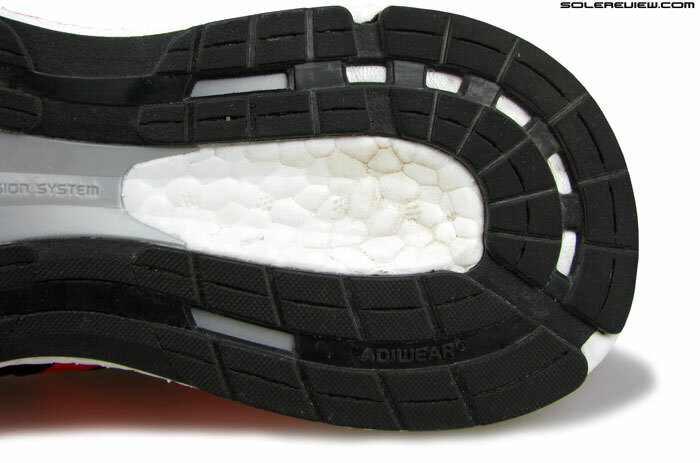 Under weight and speed, the Boost foam will reach downwards and make ground contact. Notice the dirt marks on the foam. As in many other shoes, the midsole is left uncovered in a recessed cavity under the heel. At higher speeds, the Boost foam will extend downwards and make contact, further heightening the cushioning sensation. For this picture, we cleaned up the area before shooting, but you can see faint traces of dirt lodged in between the Boost globules. 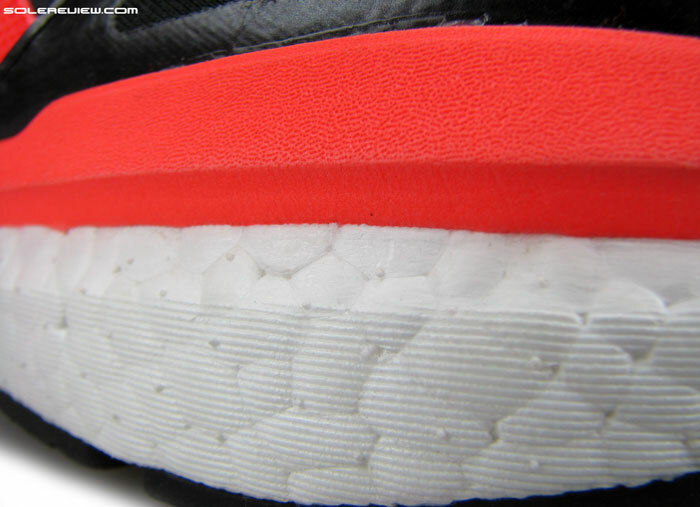 The midsole edge shoots up right under the arch area. The rims are not hard, but whether you can comfortably do a 10 miler or 20 depends on how you load this area during transitions. Like the adios and Boston, the Tempo 7 should universally do well for shorter runs up to 10 miles, although it plays second rung to adios’ more race focused feel. For longer runs, many might prefer the more cushioned Boston or Adios to the firmer Tempo Boost. Then there’s the thing about the Stable Frame midsole edges, which tends to be felt underfoot over time. But some runners might feel it more than others, while many might think nothing of it. It really depends on how you load that area in course of your gait cycle. Our opinion is that unless you crave the additional firmness and slightly spacious upper which comes with the Tempo 7 Boost, models like the Boston Boost will fulfill the same purpose. 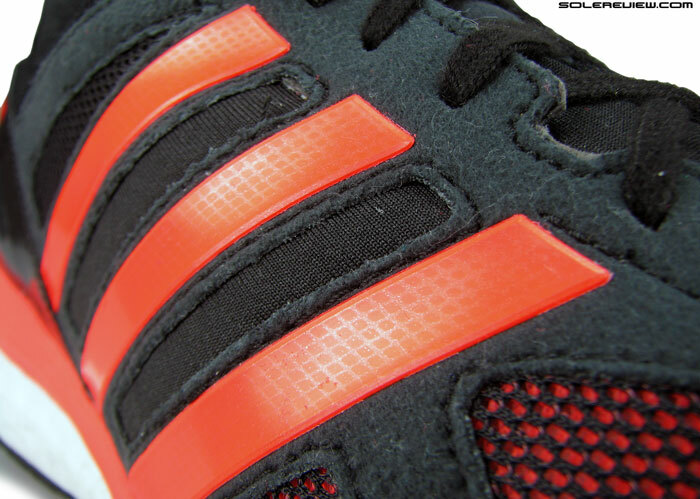 The outsole is a huge, single piece of rubber. It is wider in the forefoot and heel compared to the adios and Boston. When measured from the outsole, the midsole width in forefoot and heel is greater than Boston and adios, and this translates into a roomier forefoot fit. Why? Because it gives the upper a larger base to set camp on. There is also a fundamental difference in the Tempo Boost’s upper construction when compared to the Boston and Adios, and that happens to be an inner sleeve. A bootie construction for the Tempo Boost. Smooth interiors means none of the scratching coming from the tongue edge when worn barefoot. We’re talking about the adios and Boston Boost. 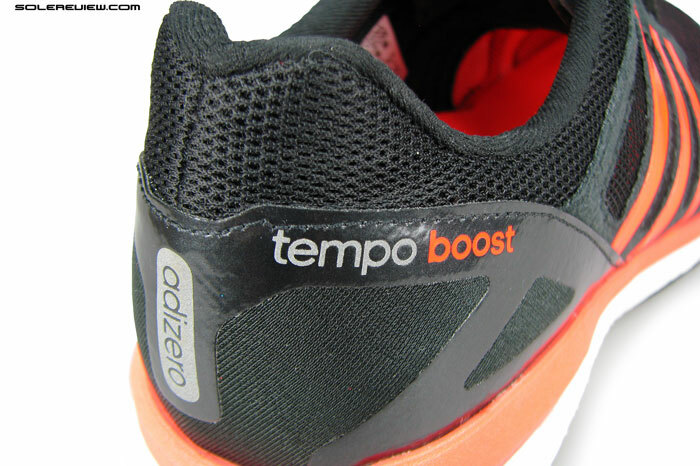 Tempo Boost ditches the free moving tongue design, and instead uses a full inner sleeve. The tongue is attached to the upper just below the eyelets, and then is further stitched to the forefoot by a flat lock seam. This gives the Tempo 7 a true bootie construction, and instantly remedies two things which we were found wanting in the adios and Boston. We talked about the scratchy feeling of the inner tongue edges when those shoes were worn barefoot. The inner sleeve takes care of that, and the shoe is as comfortable to wear without socks as it is with. 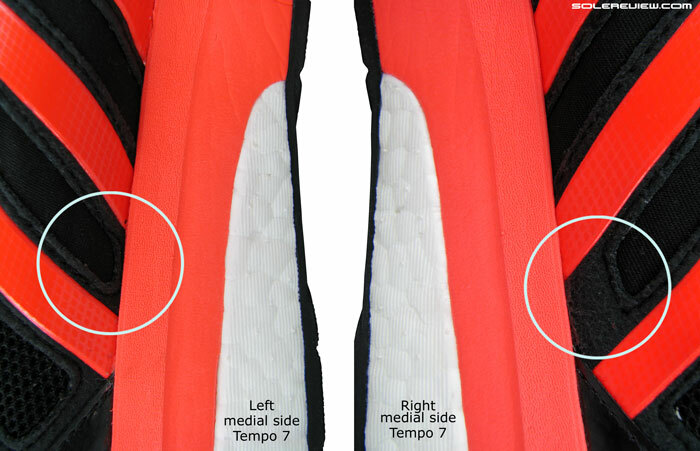 The other area is an obvious one; tongue slide, though it was minimal on other adizeros, disappears completely on the Tempo 7. Tongue is semi-stretchy, and if you loosen up the laces, it opens more room inside. Despite the space consuming nature of the inner sleeve, the Tempo 7 still ends up feeling more spacious than the Boston. One of the reason seems to be a wider midsole base, and also factor in the semi-stretch tongue. The tongue is made of a neoprene like textile with slight elasticity, and if you loosen up the cotton laces, it creates extra room inside. However, that describes the ideal scenario, which wasn’t the case in our pair. We noticed serious assembly flaws in the shoe which affected the fit quality, and is talked about in detail in the later part of this review. Like the adios and Boston Boost, vertical toe box height is cramped. The front end is very shallow. 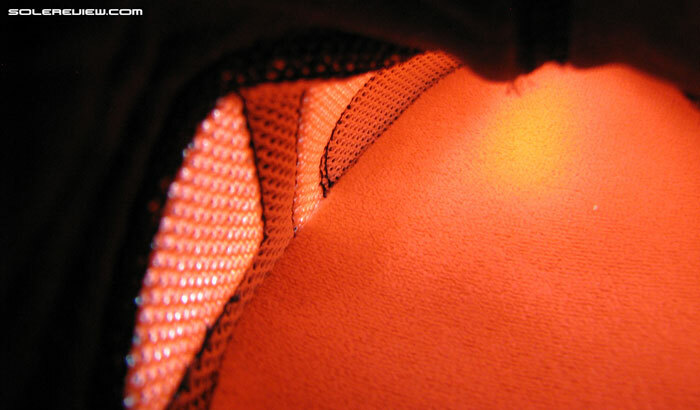 The mesh pins the big toe tight. For many runnners, this could make a case for half upsizing. The increase in side space does not necessarily translate into a more accommodating length-wise fit. Space is at a premium right at the front, with a super shallow toe box pushing down on the big toe. Typical of many adidas running shoes, many will find the Tempo 7 Boost to fit half size smaller, and opt for an upwards size over their Asics/Brooks/Nike. 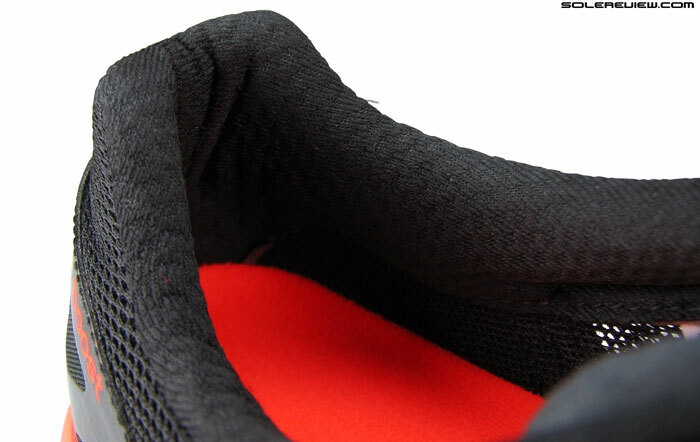 Midfoot fits well due to the inner sleeve, and the rear collar performs well without slippage. The collar lining and construction is almost identical to the Boston Boost, using a slightly narrow molding of the hard internal counter. There is one place to watch out for, and this would generally apply if you’re wearing the Tempo Boost barefoot and sensitive to Achilles chafe. Unlike the softer tongue material of the adios and Boston, the Tempo 7 uses synthetic leather near the tongue flap. 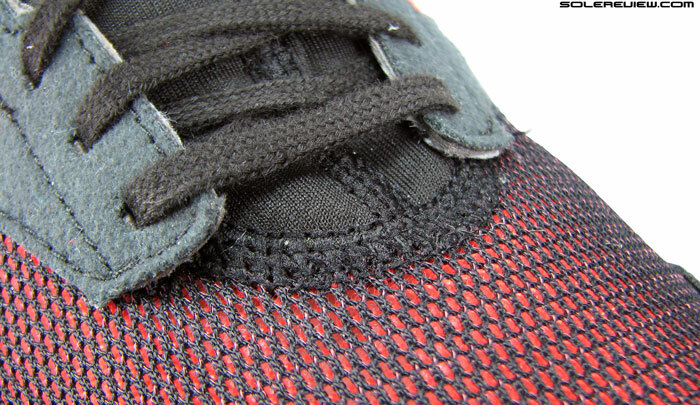 When the last row of lacing is tied tight, the folded corner of the tongue’s synthetic tends to put pressure on the foot. We felt this only on the medial side of the right shoe, but this is a heads-up for anyone who’s planning to run without socks in the Tempo 7. Breathability is on par with something like the Boston 5 Boost. Mesh openings in the rear quarter and the ventilated mesh upper do a good job at keeping cool, yet the sieve like air flow of the adios is missed. Reflectivity is included in the heel screen print with the adizero branding, and that’s pretty much all there is to it. Things would have ended rather nicely for this review if the level of manufacturing wasn’t so terrible. We felt something amiss on the Tempo 7 Boost, so we actually went out and put the shoe to additional test runs. And what we found was unpleasant, to say the least. We paid $120 for a shoe of factory second quality, a piece of footwear manufacturing rejection which shouldn’t have never have got on the boat out of far east. What was supposed to be an easy review turned out to be a tangled mess, with the shoe going back under the camera so that we can show everyone the magnitude of faults our Tempo 7 came with. You know what, we don’t think much of adidas using cheaper grade materials (Response TF Boost, Glide 7 Boost) on shoe uppers, because in most cases, it doesn’t make or break the shoe functionally. But having being in footwear product management ourselves, nothing irks us more than a pair of badly assembled footwear. What makes the case even more tragic is that the shoe was never designed to be this bad; it is simply manufacturing execution running off the rails. Because of this, we docked off a chunk of points off the total score for the Tempo 7 Boost. One could say that out shoe could be a one off case, but we beg to differ. Our shoe was bought at full price in mainland US, and this pair is symptomatic of adidas’ approach to quality. So if there was a yardstick for quality standards, our pair is good as any. And don’t believe this is an isolated case either. One of our readers recently called out a Tempo 7 complaint on the French version of Wiggle. What is just so bad about the pair we tested? The Tempo 7 fails on a couple of critical levels. One, the different upper patterns aren’t fitted properly – the way in which different upper components are placed and stitched over one another. And two, the shoe has improper lasting – the process which involves assembling the finished upper with the sole unit. Combined, both of these result in a noticeable fit difference between the left and right shoe, with the left fitting tighter than the right. It might be hard to visualize this with just words, so let’s look at few of the pictures below. Look at the area under the white circles. The leather on the right extends 10 mm over the midsole edge. On the left, the same component is barely visible. Again – huge gaps in fitting, literally. That’s a 5 mm difference. A number of pattern fitting inconsistencies are visible on the lateral side. It’s pretty clear, isn’t it? The variances in upper fitting is huge here. In the first picture, around 10 mm (!) 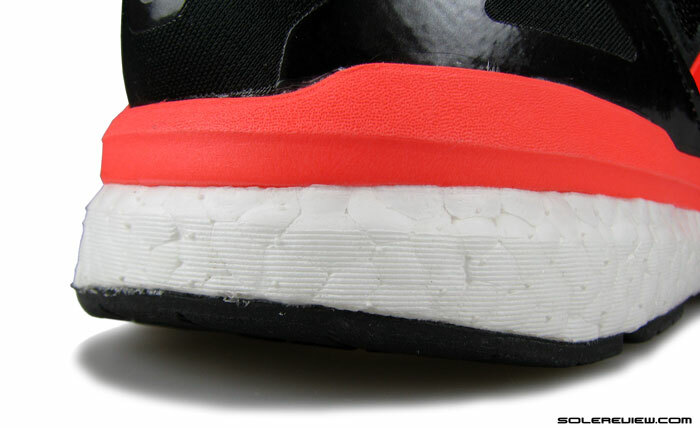 of material disappears inside below the midsole line, followed by similar discrepancies around the forefoot area (5 mm gap difference) and lateral side. What all of this does is not only reduce the amount of upper room on the left pair, but also change the orientation and lasting of the upper over the midsole. Check out what that looks like below. The blue line shows that the entire upper is off alignment. The section under the white circle shows that the base of the first stripe starts at different points on the left and right pair. And the left shoe’s upper panel is shorter by 4 mm, from first eyelet to last. The picture above shows exactly how much. Sideways length along the first stripe is off by 5 mm across the left and right pair, and if you do a similar thing for the third stripe, then it is a mind boggling 15 mm. To put that in perspective, the difference of 15 mm alone is close to the entire forefoot stack height of the midsole. There is simply no comeback for this kind of flaw. These discrepancies translates into a vertical height difference of 4 mm throughout, which means the left shoe fits tighter than the right. It also means that the left upper is fixed a bit forward compared to the right shoe, when viewed relative to the midsole. Picture on right: correct. Picture on left: cosmetic defect. This was definitely supposed to be an outlet store product. And if this wasn’t enough, the tongue flaps are sewn with a poor alignment of patterns, making the left tongue look lopsided and skewed. Even if there was nothing else wrong with the shoe, this cosmetic defect alone should have dispatched this particular pair to a factory outlet store. Even with all our tirade against quality, we feel genuine pain for the shoe. Because the Tempo 7 Boost was never meant to be like this. All the CAD files, paper patterns and the pre-production samples would have started out perfect. But then, a flawless plan is only part of the entire picture; what ultimately matters is perfect execution of that ideal, and in that department, the Tempo 7 Boost comes up short, very short. The dreaded question is, just how many such examples sit boxed in retailer warehouses and backrooms? Great review! I thank you for it! Looking forward for the Nimbus review; I hope they fare better. You’re welcome! Yes, no issues with the Nimbus, will try and get it wrapped up on schedule. That´s an eye opening review indeed. I buy a lot of running shoes from different brands and since the last few years (maybe 3-4 years) I receive more flawed pairs of shoes than I care to admit. I often thought that I was too nitpicking so it´s good to know that I´m not the only one who gets these low quality shoes. It just seems that it´s gotten worse or maybe it´s that online retailers receive more second quality products from the manufacturer? Anyway, I can confirm that bad quality samples are not so uncommen as it seems and it´s not a problem exclusive to Adidas. I got Sauconys that would lean inward, Skechers that were sewn (or glued) in a crooked way, crooked sewn Montrail shoes, New Balance shoes that fit differently from left to right, inconsistencies in cushioning between left and right shoe and/or between the same shoe models (I´m looking at you ASICS…) etc. Sorry for the rant but ordering a new pair of running shoes often feels like a gamble these days. We find minor issues here and there in many of the shoes we review, but we let it slide unless it affects the shoe functionally. Our Ghost 7 review touched on a similar topic, because that shoe mirrored some of the defects you see here. But the entire industry needs to pull up their quality socks – there are more and more substandard shoes making their way on to the shelves for $100+. I wonder how the Ultra Boost compares. A pair costs 289 SGD here in Singapore, that’s about 209 USD. One of the most expensive running shoes I saw recently except some lightweight marathon Asics from Japan. The Ultra Boost is fine, at least on our pair. Currently undergoing testing, review next week. My NB 890v4 “lost” there outsole rubber on the lateral side of the forefoot after around 50 miles – they became unstable – but I just couldn´t let them go and ran 300 additional miles in them after which the upper had many little holes (the 890v2 looked better after 600 miles). My second pair of Nimbus 15 is significantly more firm and slightly more narrow than the first pair (different colors). I had one pair of Kinvara 5 that was so “hard” and stiff that I was really dissappointed, right until I got another pair, that felt softer. The Triumph 9 had a huge inner seam on the medial side that would rub the hell out of my foot until I took a knife and smoothed the edges. But the left shoe leaned inward, like it wanted to overpronate all by itself 😉 Oh, and I went through 6 pairs of Skechers Gorun Ultra to handpick 2 pairs that at least looked flawless. If these shoes would have been cheap (30-50€) it would be ok, but were I live, I pay around 150€ for the Triumph, 125€ for the Kinvara 5 etc. That´s serious money…. Thanks for the review, you must be glad it’s done with after all the additional work it required. Pretty sad to see what (likely) cutting corners on manufacturing and assembly costs can do…Spending a few extra cents per shoe on these certainly would certainly have helped! Since it appears to have the same “Achilles’ digging” collar as the Boston Boost 5 I’m not really tempted anyway. What Adidas need is a 300 gram Boost shoe that would close the gap between the BB5/TB7 and the GB7, especially since the GB7 has put on quite a bit of weight compared to the GB6 (20+ grams). That’s the one I’d pick for my first marathon (going for ~3h10″) as it’s a tough choice between the AB2 and the GB6 right now 😉 Maybe that’s what the Boston Boost (6?) with the primeknit upper will be. Right now there isn’t much difference between the AB2 and the BB5, much less than there was between the Adios 2 and the Boston 4. Would be interesting if adidas comes up with the shoe you describe. You brought up the PK Boston, so curious to see how the Primeknit is executed on that shoe. Our sense is that it won’t be the same compression fit as the Ultra Boost. Thanks for the review. I have run just over 500 miles in a pair of Tempo 7s. The first pair I bought suffered from very poor, and partially missing, stitching around the inside of the heel and tongue. The shop replaced them. The second pair are better, but the quality is below standard. I have owned a few running shoes, but I have never seen this level of shoddiness before. Even so, I love running in these shoes. They make me want to run fast. The transition and feedback from them is great as soon as I pick up the pace. I tried the Boston 5 and found them OK, but less fun, a bit too bouncy. The Sequence 7 are supportive, but feel so heavy and unresponsive alongside the Tempo 7s. I have found the Tempo 7s strike the right balance. They are just right for tempo work, but also sufficiently cushioned for long runs of 18+ miles without any squishiness. I appreciate their extra stability compared to, say, the Adios Boost. And when I have tried accelerating towards the end a long run, the Tempo 7s are a joy. I find the fit snug, but without enough room for the toes – perhaps I am lucky, my left foot is a bit smaller than my right foot! Wonder what is happening inside adidas contracted factories in China, someone needs to pay close attention to what’s being churned out. Hope they improve. We split the review into two parts – the first section treats the Tempo 7 as if it came with no issues. We thought nicely of how the shoe rides – except that we haven’t done long runs of 18+ miles for this review. We tend to do shorter runs up to 10 miles spread over few days. Keeps recovery rate faster and injury rate lower, important for being able to continuously test products. But based on our usage pattern, we also felt the Tempo 7 to have an excellent, consistent ride and will be appreciated by many who are lucky to find a fault free pair. I just wanted to report that after 500 miles, I have not had any problems with wear or deterioration . In fact they look pretty much exactly like they did when I bought them. 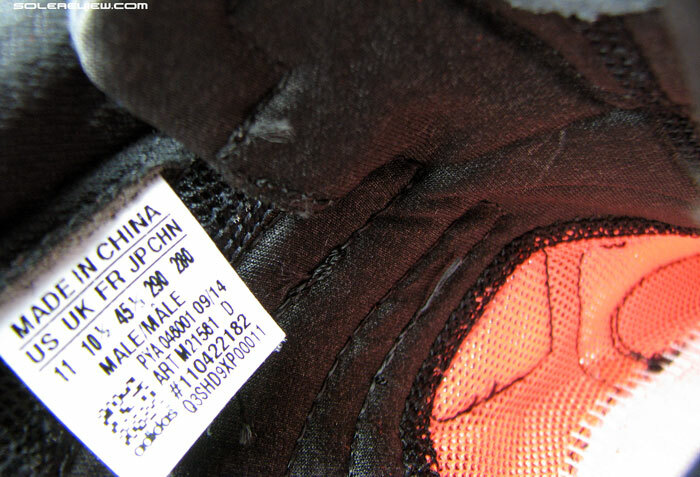 The outsole is showing some wear under the toes, but not that much! The Tempo 7s have held up very well – better than many other shoes I have run in (Brooks, Mizuno). So the construction may be inconsistent, but they solid shoes. Appreciate the insight. It is a pity that adidas isn’t doing their best to match the level of fit and finish with some of the shoe’s strengths. Especially at that price point… with their economies of scale and ability to drive down cost, that’s inexcusable. I’ve never waited so long for a review that ultimately disappointed me so much. That’s the actual shoe, not your reviewing ability. I’m a fan of the Tempo 6. Really like it and believe it does it’s job well. I’m sure you will be asked this question a lot following this review so I will get in early and hopefully save everyone else the trouble. A large part of your score was based on the poor manufacture of the product. IF, and I know it is a massive if, the manufacture was actually perform correctly, what score do you think you would have awarded? So for a lightweight, quick shoe with an element of support that could stretch to longer races, it was never going to be in the same league as the NB1500V1? That is subjective, depending on what a particular runner is looking for in a shoe. I love this site. It’s the only one I know of that does such detailed reviews. My Adistar Boost has been great and the Glide Boost 6 has also been good. Something went very wrong with the Tempo 7 Boost. The shoe does have a cheap look about it but I didn’t expect such horrendous quality control. Maybe it is the elastic tongue construction which proved a harder nut to crack during manufacturing. We see a lot of examples of poor finishing, but we let it pass unless it created a functional defect. Sadly, the Tempo 7 was one of those cases. Yes; I’ve seen a bit of it too and some inconsistencies between pairs. My multiple pairs of Flyknit Lunar 2s had the Nike logo painted in slightly different locations but nothing like what the Tempo 7 had within the same pair of shoes. Minor cosmetic issues happen all the time, and that is ok. Shoe making is much more of manual process than most people think, so hard to be 100% perfect. But functional issues? That is a no-no. Thanks for another amazing review. I recently went into a store to look at the new Ultra Boost because your reviews of other Boost models had me curious. I actually took pictures to send to you, but I needn’t, because you’ve done a superb job here of explaining what I saw. I was aghast – the variations from shoe to shoe were incredible. You didn’t need calipers for this, to the naked eye the flaws and variations were big enough to run a flatbed truck through, Glue stains were all over where parts met. Parts were grossly misaligned… What is happening with this company? It seems they found a technology that makes them unique and decided their job was done. That’s far worse than if they simply made a more mediocre, garden variety shoe but made it properly. You’re doing a great service and I thank you again. You’re very welcome, and thank you for the feedback – can instantly visualize what you’re describing. We think it’s the Wall St pressure acting up on adidas – cut material costs, speed up manufacturing turn but reduce rejection rates (two opposing forces) and other force feeding techniques. Maybe there’re not enough adidas people hand holding factories. We’ve seen that one has to micro-manage athletic footwear factories. Even top rated sheds need constant supervision, and never run well on auto-pilot. During my career as an engineer, I have had occasion to be involved with quality and manufacturing problems. Manufacturing is a difficult enterprise! “Escaping defects” is a statistical fact of mass production. I’m not trying to make excuses for Adidas, but your review is a on a sample of one. So what is the warranty and return policy on this product? Perhaps that should be included as an addendum to this review. The fact that manufacturing is hard isn’t lost on us! Been on enough footwear production lines for weeks at a time to realize that. Have tremendous respect for the workers who put in many, many hours doing the same thing, over and over again. Agree, rejections are an inseparable part of the making of industrial products such as athletic footwear. Each batch will have a certain % of defects and that is why open costing quotes from factories include a certain rejection percentage. As you know, this is over and above the material cost (including nesting/waste upcharges), Labor/overheads and costs arising out of amortization schedules on account of footwear tooling. So once the rejection % is accounted for, the effort is to control that number. That requires multiple trial runs before the product is ready for commercialization. The final RFC sample is usually what’s the benchmark for quality, and on a tightly run ship, everyone on the line knows what it looks like. Footwear defects are of two kinds – the one which you can tell visually and the kind which you can’t, like inner seam issue, difference in midsole densities, etc. The magnitude of defects on our Tempo Boost reflect a lax QC process – and that’s super critical, because that feedback goes back to the origin, the line operator/supervisor where the defect was passed undetected. If QC fails, the operator will think there is sunshine all around and keep doing what he/she is doing. Concur this is a sample of one, but don’t believe this is a chance occurrence. Just on solereview alone, there are already three comments with similar feedback, specific to this model. Our review is doing adidas a big favor by calling out the shoe’s flaws. Appreciate the suggestion about the return policy, but won’t include it. Our visitors are from all across the world, and there isn’t a uniform policy for exchange/returns. Nicely explained! The weakness in this process is human visual inspection. All it takes is a moment of lost focus and a bad item goes out the door. Even worse, a worker has a bad day, sick, ill, or stayed out a bit too late. I worked in a factory where management would ramp up to three shifts when demand increased. Guess where the majority of the defects were coming from? Those poor third shift people weren’t as well trained, and even less supervised. I hate to say it, but machine vision inspection, robots, and miscellaneous other automation is the answer to these human-caused errors. Adidas should indeed welcome your detailed feedback! One question you might be able to answer which I have always been curious about…how much season-to-season control do shoe companies have over the characteristics of their products? How much variation is injected by the contract factories? a) The originally designed product (or suggested materials) was too complicated to make with existing process, so the factory suggests a more practical approach. The contract supplier, along with the brand’s developer, might also recommend substitute material(s) to match the target FOB cost. b) Material MOQ’s are fairly high, so they tend to be consolidated across models (sharing). So let’s say 3 models out of 10 are dropped because of low demand forecast from the brand’s sales teams, or during the retailer order booking session. In this case, the factory might suggest a material switch for reconsolidation. This is more often than not a very painful process, so brands make sure to avoid that from happening in the first place. I would have guessed less control. This implies next-model variation from current-model is more controlled by design than I would have suspected…interesting! The scenario of less control might currently apply in a couple of cases. One, lower end brands (sold in Walmart, etc) might not have a large design/development team, and rely on factories to offer them options, which then can be selected. All major factories have their own designers and developers. Two, a brand is licensed to a local distributor in another country. That company might make their own products (again, relying on the factory for designs) and pay a royalty to the brand. These days, all products tend to follow seasonal design direction, so no room for independent, design influencing inputs from factories. Like all the colorists following the category moodboard, material picked from the seasonal trend library and so on. All that happens within the confines of a brand. To put it simply: Finalized design concept (brand) and commercialization (factory) are distinctly separated, functionally speaking. One of the best solutions to the manufacturing quality problem might be for the manufacturer to spend a little bit more money in the commercialization phase, but in order for them to do that, they’ll need a little bit of intermediation of agencies to take place (cutting out some of the middlemen who eat up some of the markup). As we’re moving to more of a digital age, with companies who can be the Uber-for-“X”, I can foresee some of this happening quite soon even in the sporting goods industry. That’s a good thought worth a discussion or two.The middleman-less scenario is already happening in the sporting goods industry, a term which brands call as DTC – direct-to-consumer business on both the online and brick/mortar side. It has started to become a larger part of the businesses nowadays, but it will not reach a ‘Uber for X’ scale anytime soon. For the simple reason that sporting goods is not a service industry but in the business of selling industrial products. It is also a packaged commodity, meaning MSRP parity needs to maintained across multi-channels when it comes to recognised brand names. And not sure whether a DTC approach translates into gross margin expansion; there are targeted costs like inventory holding and other areas which would normally not be a part of the wholesale model. There will always be fringe players who support that line of thought. Like Feetz, who 3D-print their customers’ orders and ship directly, but there is a limit to how much 3D printing can do in the athletic footwear industry. Elastomer based substrates can make solid and flexible components, but still very far away from making soft materials capable to replicating the feel of meshes and leather. It should be noted for the record that after reading this review and learning that the Ultra Boost had just become available at retail outlets I went to a large retailer in Manhattan that I don’t usually patronize to view it. The store was eager to show off a new $180 shoe that the company touts as the “best running shoe ever”, and so they’d erected a large point-of-sale display for it on which was mounted several retail pairs. Every pair had extensive glue splotching and several visible differences in construction. IMO even glue staining is unacceptable in such a costly shoe, much less random dissimilarities from pair to pair. Here in NYC we have stores that sell secondary market shoes. That is, bona fide products of the manufacturer, but that are assembled in far-flung factories where QC may be lax for sale exclusively at discount outlets. This was not one of those, but a first-level retailer. Your reviews and input are so valuable. Thank you for sharing! I am a long distance runner and I desperately need your thoughts! In the past I used to run with Nike (like Lunarglide) but as I started adding Ks to my runs I felt like there are other better choices for long and fast distance running. That’s when I tried Boost and felt in love with them but at the same time I had an injury on both feet (as I am having pronation) so decided to go for foot analysis. I tried 3 times (!) to comfort myself on tailor-made soles (each time I was doing the analyisis so to base the new soles) but I always end up with terrible pains mostly on calves! It seems that my feet after 39 years don’t want to accept such a radical change on how I step on the ground! But having currently Adidas Adistar and Ultra (both neutral as waiting to put my tailor-made soles in them) as my shoes for training and racing respectively, obviously they do no good to me so this is the reason I am writing to you as I am urgently looking for support shoes for pronators. I am dissapointed with your review on Tempo 7 as I knew they are light, fast, cushioned, with nice fit and so on (still with low degree of support). And knowing that Sequence is quite heavy for races, half-marathons and marathons, I am curious on what I should go for. Read here that NB 1500V1 is a super shoe based on all above criteria writen! Do you believe this is the one I should buy? What’s your thoughts? The Tempo 7 Boost isn’t a bad shoe at all, if you manage to find a defect free pair. The New Balance 1500 V1 is pretty awesome, and alongside you can try the Skechers GoMeb Speed 3 too. All of these are fast, cushioned and feel supportive enough. The general Boost rule of thumb is: the more Boost foam, the more expensive the shoe. Ranging from the Sonic and Response on the lower end, to the Energy and Ultra at the other end with a full Boost midsole. However, there is one exception, which is the Adistar Boost. At 170 dollars, it’s the second most expensive shoe in the range after the Ultra and has much less foam than the Energy, Glide, Sequence and even the Response. I know you haven’t tested it, but why do you think that is? Because it has the complicated Formotion insert in the heel. Great article. 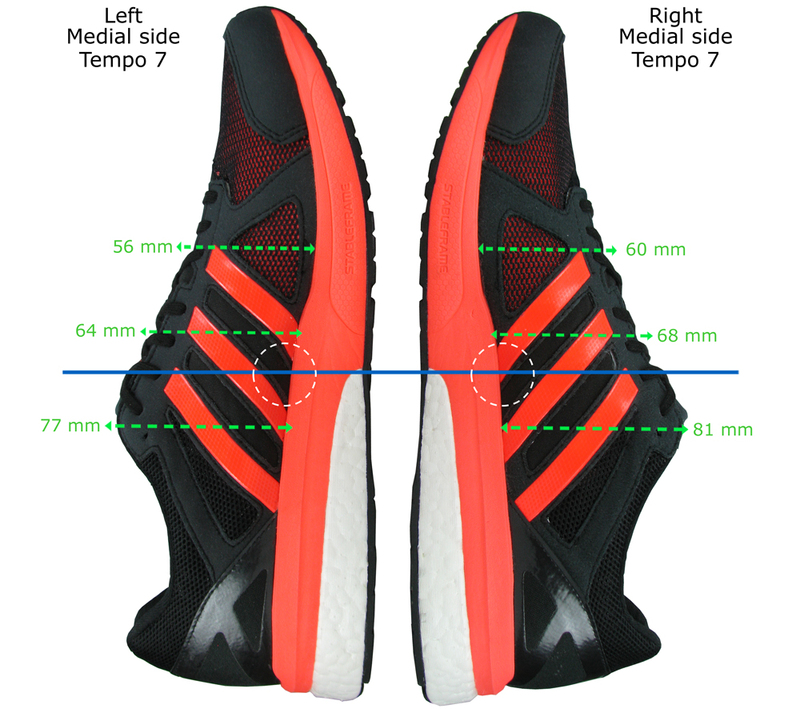 Just with this: “Typical of many adidas running shoes, many will find the Tempo 7 Boost to fit half size smaller, and opt for an upwards size over their Asics/Brooks/Nike.” Wouldn’t you go a half size DOWN from a Nike? No, you won’t go a half size down from a Nike, but up, as the Tempo 7 fits smaller. Is there a better way to put this than what we have? Let us know. There is no substitute for a personal fitting session, no matter who or what anyone says, including our reviews! Wear and tear report for anyone interested: I have run with two pairs of Tempo 7s for several months now. I have put more than 800km on one pair and 700km on the other. They are holding up very well indeed, despite getting regularly wet and muddy in our Glasgow ‘summer’ conditions. The grip is still good, the upper holds my foot in place nicely, and they feel stable. I am quite pleased with them. Thank you for sharing the feedback. Very helpful. I have run 200km in my latest pair of Tempo 7s. I noticed today that the plastic insert (“torsion plate”) on the bottom of the right shoe has fractured, top to bottom. I hope this is visible on the attached picture. Have you seen this sort of wear before? I wonder to what extent it will affect how the shoe performs? Never seen that before. This should qualify for a replacement, you should go ask adidas. Thank you. I will do. By twisting the shoe with my hands, the two halves of the plastic come clean apart. I am surprised that the plastic seems so fragile. Usually these parts are super durable, so surprised to see that as well. Ordered a pair of these from n online retailer in the same size as my sequence boosts. Having read your review I was hopeful that the quality issues would have been sorted. They weren’t. There were big differences between the left and right shoes. The right one looked good but the left was all over the place! Some panels were missing stitching and there were lots of loose threads. The shoe itself was much tighter than the right one. My left foot is slightly bigger than the right but not by that much! Hardly any of the panels matched up with the opposite ones on the other shoe. I think while the control quality control is obviously lax, the faux suede material used in the shoe panels is also a factor. I would think it’s stretchy and could easily be pulled out shape during the manufacturing process. Thankfully the company I bought the shoes from has a free delivery and returns policy so I wasn’t out of pocket. Such a different experience with these than with my sequence boosts. Just this morning I clocked up my 1000th mile in them and they’re still in great shape with plenty of bounce and protection. Without doubt the best shoe I’ve ever had. So adidas can do it! Thank you for the feedback! The Sequence Boosts are great – one of top rated shoes. Sad to hear that adidas dropped the ball on the Tempo Boost; it is understandable that the materials are stretchy, but still no excuse for a company of adidas’s standing. Hey there, love the review. I am running in the sequence 8 now and am curious if the difference in support is really that noticeable. I am a little bit injury prone (shin splints) so that is a factor, but sometimes the sequence just feels sluggish and I’m looking to see if a faster shoe like the tempo would hold its own against the sequence’s stability. While the Tempo and Sequence 8 are both support shoes, they differ in a couple of areas. The fit on the Tempo Boost is much narrower, and the midsole footprint is slimmer. The overall tone of the Tempo Boost is supportive, but you’ll miss the wider plant of the Sequence 8. Does it feel faster than the Sequence? Yes. Hey, I’d love to hear your advice. I’ve been running in Adizero CS10 for a couple of seasons (and Adizero Tempo before that) and I want to try the Boost series now. CS10 was perfect so I’d love something similar (maybe lighter); would you recommend CS Boost, Boston Boost or Tempo Boost? Boston seems to have great reviews but maybe it’s better to stick with the CS model I know and like? Haven’t tried the CS10, so don’t know how it compares to the Boost line-up. But looking at the picture, it would seem that the Boston Boost could be a replacement. First thank you for the detailled review and your website in general! But I’m wondering why you are writting in this review thas the tempo is the firmer of the Adizero trio. The tempo get 4 over 10 in this review for its forefoot cushioning and the Adios 2 got only 2 over 10. For a fore/midfoot strike runner is the tempo not more cushioned than the adios? I would like to know also. Due to its extra firmness can not have the tempo an advantage over the Boston for short distance run (below 10 miles)? Do they not feel something snappier? That’s correct, the Tempo felt the firmest of the three. Comparing the scorecards won’t make sense, because we’ve since evolved the format. We also use the word cushioning and softness as two separate terms. A shoe can be firm, yet be more cushioned (meaning more foam volume). From that perspective, the Tempo Boost has more material than the adios Boost. Our personal preference is a lightweight, firm shoe for shorter faster runs, but others might prefer something softer. It really depends on the runner. The Tempo Boost does not have a significant advantage over the Boston Boost, the difference isn’t a lot.